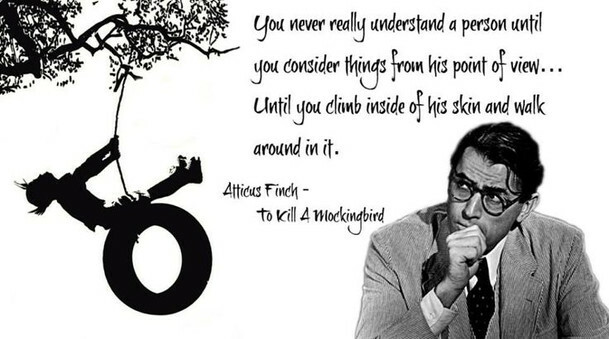 By saying these words Atticus Finch tries to teach his young daughter, Scout, a well-known approach how to better understand people’s inner motives and get along with them better as a result of it. To really understand a person and know their ways, one has to distance himself or herself from their own habitual point of view. A person needs as if glance inside other person’s mind to learn their pattern of thinking, the reasons why they do the things they do and their behavior. This trick is really helpful because, first of all, a person might get insight into other people’s inner lives instead of just being angry at them, which is impractical and will not improve the situation; and second, it is a means of predicting people’s further actions and what to expect from them. Knowing someone’s background is sure to offer a better understanding of what is going to happen. To have a better idea of what is going on, one must from time to time pay attention to other people’s lives, not only to his or her own. This is the thing that most adult people know, but Scout might be too young to be fully aware of it. That is why her father has to teach her this useful “simple trick”. However, Atticus is well known for his compassion and sympathy for people, even the ones he don’t like. In this situation he tries to persuade his daughter not to be angry with Miss Caroline, her school teacher, for her strange behavior at school. He explains that this disturbing behavior probably wasn’t intentional, because the teacher might just have tried to do the best she can do in the circumstances new to her. The metaphor used by him sounds like a rendition of an old proverb telling to “walk a mile in someone else’s shoes”, which mean you have to know people’s background and the situations they got into in their lives before judging them. The fresh metaphor he created serves to once again hint at the theme of racial issues concerning people of colour, which is the most important theme of the book. This is important advice a child can get from their parents early in life. Learning it offers both a new and useful perspective and an important moral lesson that Scout learns from this conversation, and it later helps her build her empathy and improve as a person.